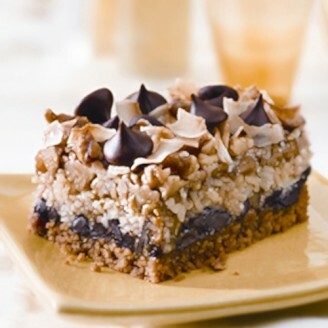 Seven fabulous layers with dark chocolate chunks and milk chocolate Hershey's Kisses melded with coconut scattered butterscotch and walnuts. Richly flavorful cinnamon spiced apples, alternating with buttery coffee cake and topped with crisp, cruncy crumbs. Brownie batter hand swirled with semi sweet chocolate chips, natural white chocolate disks, dried Bing cherries and cherry essence. Chewy butterscotch squares, liberally studded with walnut chunks and bittersweet chips. Tasty blueberry preserves layered between an all-butter crust and topping. Chewy chocolate squares liberally studded with walnut chunks and bittersweet chips. Tart Granny Smith apple chunks and custard in granola shortbread drizzled with caramel. 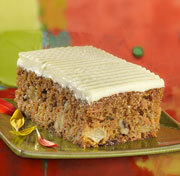 Dark, moist carrot cake studded with raisins, walnuts and pineapple. Combed with our tangy cream cheese icing. 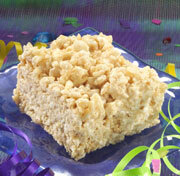 A traditional favorite, crispy rice cereal folded into a rich marshmallow and butter cream. Homemade marshmallow cream gets folded with gluten free crispy rice puffs and mini marshmallows. Just a touch of the butter gets browned, but enough to bring up a subtle caramel note. A hint of sea salt makes it all come alive. Rich dark chocolate batter topped with buttery caramel and dark semi-sweet chocolate chips. 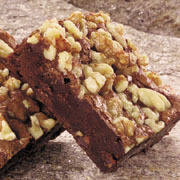 Marshmallow-studded chewy chocolate and honey roasted walnuts stack high on buttery brownies. A tango of chocolate brownie and truffled cream cheese, with ripe red-luscious raspberry and white and dark chocolate drizzles. 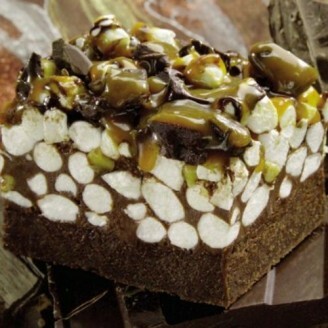 Cocoa Cow Brownie: An all butter artistically marbled cheesecake bar that will absolutely melt in your mouth. 32 cut - 12" x 18"
A very rich, dark, dense brownie made with real liquor chocolate, semi-sweet chocolate drops and all natural vanilla. Includes one tray each of Summerberry Stack, Totally Oreo Brownie, Fabulous Chocolate Chunk Brownie, Lemon Crumb Bar, 7 Layer Bar, Apple Crumb Cake, Toffee Crunch Blondie and Chocolate Peanut Butter Stack. Includes one tray each of Espresso Brownie Bar, Carrot Cake Bar w/crust, Rockslide Brownie, Banana Cha Cha, Chewy Marshmallow Square, Apple Frangipane, Raspberry Sammies and Oatmeal Cranberry Mountain Bar. 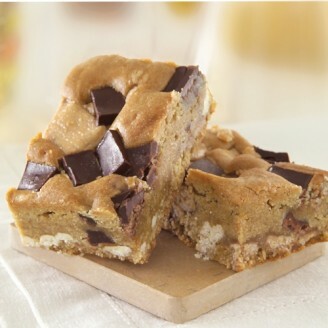 A buttery chocolate, chewy brownie generously studded with Hershey's milk chocolate kisses, bittersweet & semi-sweet chocolate chunks. An elegant brownie layered in a buttery crust with golden walnuts and chocolate chunks and drizzle.